JNN 22 Nov 2014 Washington : Nothing new came from US President Barack Obama’s visit to Riyadh on March 28, except a few additional photographs of the leaders of both countries and a modest dispelling of some contentious issues. Other matters were left to be treated at another juncture, as former Saudi diplomat Abdullah al-Shammari told Al-Monitor. On the day Obama arrived in Saudi Arabia, Al-Riyadh newspaper published an editorial by Yousef Alkowaileet titled “Divorce or New Relations with America?” The article discussed the reasons behind the tensions that existed between the two countries, including Washington’s negotiations with Tehran. Alkowaileet alluded to the latter by criticizing Obama’s good-faith gestures toward Iran, reminding him that the Saudis know their region’s history very well. “Before Obama’s arrival, Riyadh sent indirect messages stating that it will warmly welcome the US president, but Saudi Arabia doesn’t want to hear mere sugar-coated words and empty promises that will not turn into real policies,” Shammari said. Despite Obama’s visit, the United States and Saudi Arabia still cannot see eye to eye on a number of regional issues, in particular Syria, Iraq and Iran. 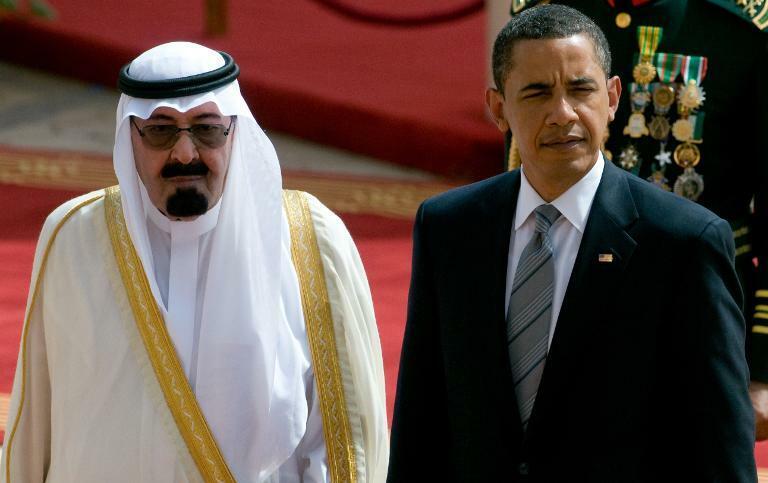 During his visit, Obama told the Saudis that he would not agree to a bad deal with Iran. But what concerns the Saudis most is that Washington’s assessment of what is or is not bad may not conform to their own assessment. However, doubts about the future of these four pillars have emerged. Saudi Arabia’s control of the oil market depends on its possession of spare capacity, estimated at 2.5 million barrels a day. It is currently not certain that Saudi Arabia will maintain this production capacity. In a report issued by Citigroup in 2012, it was expected that local Saudi oil consumption will weaken this capacity gradually, and the kingdom will have to import fuel by 2030. The Saudis disagree with this assessment. Prince Turki al-Faisal stated during a forum at Harvard University on April 25, 2013, that the kingdom will increase its production capacity to reach 15 million barrels a day to overcome the problem of increasing local consumption, so that it does not affect the spare capacity. Moreover, the United States has become less dependent on oil. Prominent economist at NGB Energy Investment Management and oil expert Ouns al-Hajji said to Al-Riyadh that US oil imports have dropped to 50% within the past seven years. He noted that the country’s oil imports in 2006 amounted to 12.4 million barrels a day, and have currently reached 6 million barrels. According to Hajji, US oil production had reached 11 million barrels a day by the end of the first quarter of 2014. Saudi Arabia’s spare production capacity in the oil market is dwindling, while the United States is enjoying more oil independence and is thus less dependent on its strategic relationship with Saudi Arabia. The changing energy landscape has significant ramifications for US-Saudi relations. Riyadh will no longer be able to use oil as a political weapon, as it did in the 1970s, and will struggle to influence Washington to acquiesce to its regional outlook. The Two Holy Mosques in Saudi Arabia give it its spiritual power in the Islamic world, but this element is changing for several reasons. First, the new communication revolution has disintegrated power and contributed to establishing several spiritual centers within the Islamic world. A small country like Qatar has managed to have significant spiritual and intellectual influence through Al Jazeera and religious figures such as Yusuf al-Qaradawi. The same applies to the United Arab Emirates and Turkey, and perhaps Egypt at a later stage, where competitive centers of spiritual influence are emerging. Second, the kingdom has been involved in regional conflicts against other Islamic forces, whether against Iran or the Muslim Brotherhood. As a result, Saudi Arabia’s influence over Muslims is waning, as indicated by a 2013 Pew Center survey that showed its popularity dwindling in the Middle East. The United States relied on the spiritual role that Saudi Arabia represents to influence Muslim attitudes. Saudi Arabia played a pivotal role in confronting communism and countering terrorism, but the multitude of centers of influence in the Islamic world and Saudi’s declining position have undermined this factor in maintaining the strategic relationship between the two states. But tense relations between Riyadh and Washington, or the divergence of viewpoints between them, will not keep Saudi Arabia from using its spiritual position to fight terrorism, as this is in Saudi Arabia’s interests regardless of US considerations. Meanwhile, the war on terrorism, which was considered one of the main commonalities between the two countries in the past decade, has turned into a point of debate between Riyadh and Washington regarding Syria and Egypt. Saudi Arabia supports extremist factions in Syria, while Washington considers them to be close to al-Qaeda. Saudi Arabia considers the Muslim Brotherhood in Egypt a terrorist organization, while Washington sees it as a political power having the right to participate in the democratic process. Saudi Arabia is also uncertain of Washington’s commitment to Persian Gulf security. Washington’s perception of security in the Persian Gulf is different than Saudi Arabia’s. This difference appears in Bahrain, as the kingdom opposes any concessions presented by the Bahraini government to the opposition, while Washington is exerting pressure to push the Bahraini government to make concessions and implement serious political reforms. These changes in the four pillars, which constituted the cornerstone of the strategic relationship between Riyadh and Washington, have pushed Saudi Arabia to consider new options. Two weeks before Obama’s visit, Crown Prince Salman visited China for three days. Prominent Saudi Arabian journalist Abdul Rahman al-Rashed, who is close to the decision-makers in Saudi Arabia, commented on the visit in an Al-Arabiya article titled “China and the Future Alliance with Saudi Arabia.” He called on a new way of thinking to achieve security for the region, given the possible decline of the US role. While Saudi Arabia would be better served to maintain its ties with the United States, the timing of the visit holds a Saudi message for Washington that Riyadh has other options to fulfill its interests. This entry was posted in Middle East, United States and tagged Oil Market, Saudi Arabia, Saudi Hegemony, Saudi Spritual Status, Saudi US Relations. Bookmark the permalink.